Watches were once an item I wouldn’t leave the house without. From hideous Swarovski encrusted silver bands in my teens to my childhood watch that came with 12 different coloured interchangeable straps; the wrist has been subjected to poor design for far too long. Denise Julia Reytan however is here to save our wrists with her faux-watch gold or silver plaited bracelets. From her T1impiece collection these retro Casio replicas rejoice in the good old-fashioned watch designs that can now sit happily back on our arms in a purely aesthetically pleasing fashion. 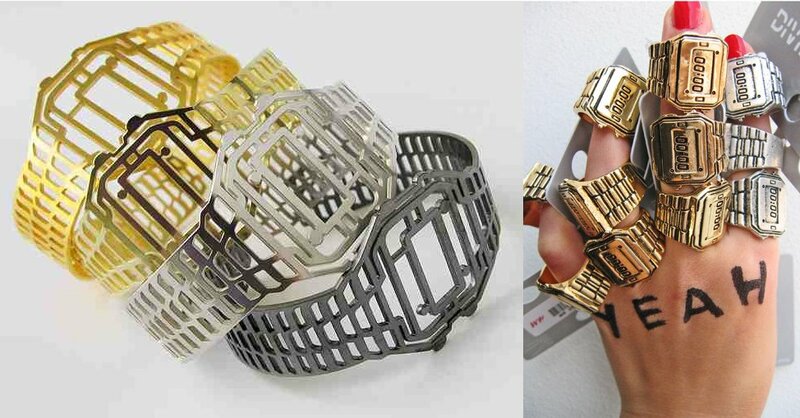 This is not the first time though that the German jewellery designer has used watches and timepieces as inspiration. You may recognise her mini watch rings that were designed for H&M Divided in 2007. Check out her site here for a peek into her colourful and eclectic world of fun trinkets, charms and silicone cast necklaces.